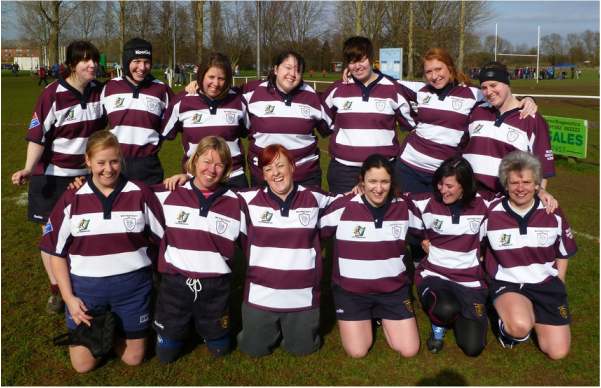 A group of Bletchley Ladies Players and support team travelled to the Lawson Keys National Rugby Awards at Twickenham in high hope of winning awards that they were short listed for. The whole team was nominated for Ladies Team of the year after a stunning 2014-15 season which found them unbeaten in the league and losing out to Kendal Wasps in the Semi Final of the national cup. Lauren Delaney had also been shortlisted for the Ladies player of the year after a stunning first season playing rugby which found her being Bletchley’s and Bucks County highest try scorer. Both categories were very competitive with a diverse range of nominees shortlisted which included premiership teams and players. The award ceremony was previewed with a visit to the England home changing room and a pitch side champagne reception before entering the immense Rose Room for the banquet dinner, entertainment and awards. Despite hoping for the best, Bletchley ladies were unable to secure either of the awards nominated, coming runners up in both categories with Saracens ladies winning the team trophy and Lucy Meadley of Carlisle receiving the ladies player trophy. Despite the inevitable disappointment the Ladies did the club proud and getting a mentioned in the National Press after making a fantastic impression on one of the guests, royalty of rugby Jeremy Guscott, who will remember his meeting with the girls for a long time.